Communities have been the watch word of the new media revolution, but what does that really mean? it means we are returning to relationships. Everyone thinks it’s a revolution, when in reality it’s a return to old-fashioned values. Relationships and values in the sense of the baker, the butcher and general store owners down on Main Street. People want to know their vendors, they want to interact with them, and most importantly, they want to be heard! Instead, the small town feel is now a global phenomenon – creating millions of global micro-communities. It is true that we are looking to the businesses we interact with to be more .. interactive. We, as consumers want to be able to reach out to these companies with our complaints and our compliments. The irony of technology bringing us together and forging old-fashioned relationships is not lost on this author. What also is not lost is the importance of these relationships. In the social media world, we are coming more and more to understand that without the quality of relationships, we are floundering. It is our responsibility as practitioners of this art to find ethical, realistic, authentic ways to build those relationships. To find ways to help our clients build those relationships. To show them the importance of open, honest, transparent communication that are the bricks and mortar in the foundations of those relationships. guitarmantoo@gloriabell The interesting conversations, things I’ve learn and the diverse people. jacobburke@gloriabell The biggest benefit of being on Twitter for me is the new business connections that I have made. krisis@gloriabell Re: twitter benefit, just having an instantaneous commonality engine at my fingertips exposing previously invisible connections. The common thread is quite evidently the conversations and the relationships that develop from those conversations. Whether we are using the tools, like Twitter, for business or personal reasons the importance of the relationships is prevalent. People want connections. We want to return to the feelings of chatting on the porch with our neighbors. Shopping at the corner store. The feeling of knowing that when we reach out someone will be there. It is a magical time that technology and social media have allowed us, as people, consumers and businesses to make those connections. What now becomes important is that we do the work necessary to maintain them. Just as any good relationship between two people requires work and give and take on both sides, so do these relationships we develop online. They require that we engage one another. That sometimes we be the givers and sometimes we be the takers. That we truly listen and answer more than we talk or broadcast. It requires us to make a commitment of time and energy. And it requires that we, as social media practitioners be prepared to assist our clients with not only seeing this reality, but learning to live it. As I tell my clients (and everyone else) social media is not something you Do, it is something you Live. Quite simply, you do not “do” relationships and conversations, you “live” them. So my challenge to all of you is go Live it. Let your actions speak louder than the words you type. Let your interactions and the relationships that develop from them be the model for your clients and friends to emulate. Go start the conversations. Return to the relationships. Remember the fallen. Freedom isn’t free. There are thousands of men and women who have made the ultimate sacrifice for our country. They have given their lives to make sure that those they loved could live in freedom. We who have shared the rigors and joys of military life live(d) every day with the knowledge that those we cared for could be taken from us. Sometimes they were. While Memorial Day is a lovely thought. A day for us all to remember the sacrifices made by not only those who have served, but by their families, their loved ones, their friends, their communities. The reality is that Memorial Day should be EVERY DAY! Every day, we should take a moment to remember those who have sacrificed for us. Whatever our politics, whether or not we believe that the cause is right or just, we need to remember the loyal souls who believed enough in our country and the people who live here to fulfill their duty. So I can only say a heartfelt THANK YOU – your sacrifice and service will never be forgotten as long as there is one American whose eyes still get misty when they see the flag and whose voice still raises at the first note of the National Anthem. I will never forget you. Remember the fallen. Freedom is not free. Who says Twitter relationships are not real? I write this through tears that are clouding my vision. I received news today of the passing of one of my Twitter peeps @lilyhill. While “Lily” (Roberta Frazier) and I never had the chance to meet face to face, we did share some lovely conversations and I always looked forward to seeing what she had to say. In some ways it seems odd to feel the profound sadness that has come over me at the passing of someone I really had never “met”. But, I do feel a deep sadness. A sadness for Roberta’s family – my heart aches at the thought of her daughter having to type that final tweet from her mother’s account – A sadness at a life lost way too early; A slightly selfish sadness that I will no longer be able to avail myself of Roberta’s wit and wisdom. And an even more selfish sadness at the reality of my own mortality. What strikes me even more is that I am feeling this deep sadness for a person that I only knew electronically. There are people who try and claim that the relationships we develop through Twitter are not “real”. They are a result of snippets of information that we chose to share with the world and have no basis in the deep understanding necessary for true relationships. I say they are wrong! In the almost 2 years that I have been on Twitter I have been blessed to interact with people all over the world that I now truly call FRIENDS. Some I have met in person and some I have not, but that does not lessen the feelings I have for these people. Some of the people I now consider my dearest friends, that I consider my extended family, I met on Twitter. The bits and pieces of our lives that we daily share with each other on Twitter are the building blocks for those relationships. The times that we laugh together, support each other, educate one another, just chat, share virtual hugs, share wisdom & insight and on days like today, cry together. This is what builds those relationships. It is wonderful when proximity allows us to translate those into “real life” friendships, but I don’t feel any less for those I am close to on Twitter who are in Florida, Missouri, California or Australia than I do for those right here in my own beloved Philadelphia. I can feel their love, kindness, support and caring as strongly as if they were sitting here next to me. Twitter has allowed me to grow beyond my own little geographical world. It has allowed me to touch and be touched by the power of people from everywhere. For that I am eternally grateful. I wrote “An Open Letter to My Tweeple” back in February 2008 describing what Twitter meant to me. Those thoughts and feelings are amplified exponentially with each day that I spend engaging in conversations and interacting with my community on Twitter. So to those who would say these relationships are not real – I on behalf of the Twitterverse say you are very, very wrong. The sadness I feel right this moment at the passing of @lilyhill is proof. Would I recognize you offline? We have all developed a “persona” that we present online. It is a combination of our avatars, pictures, videos, words, actions, reactions, everything that we allow the public to see on their screens. But how much of that public online persona is who we really are? If I chat with you on Twitter or some other social networking site, view pictures of you on Facebook or Flickr, read your blog, watch your videos, listen to your podcast or even just look at your avatar is the person I am interacting with online going to be the same person I would meet at a cocktail party, a business meeting or a networking function? Will you look the same? Will you talk the same? Will your attitudes and behaviors be the same? The words “authentic”, “transparent” and “real” are bandied about with pronouncements for everyone to be these things. But what do they mean? When taken in their normal context the meanings are pretty self-explanatory. When these terms relate to social media/social networking, they really are not that different. Defining them in the online space is easier when you ask a few simple questions. Are you “authentic”? Is what you say and how you say it online consistent with the way you talk and the things you talk about offline? Are your actions consistent online and offline? Or is what you say and how you act online based on who you think your online community expects you to be, as opposed to how you think/talk/act offline? We all want to present ourselves in the best manner possible. Sometimes being online is like being on a very long first date. But, just as naturally happens in a relationship, sometimes you have to let your faults show. It is what makes us human and what maintains relationships beyond that initial attraction. So is your online self a true reflection of your offline self? Are you “transparent” enough – Do you share enough online that I would feel I know you if we met in real life? This does not mean that I need to know every meal you eat, every person you date, every tiny detail of your life. It simply means that you are sharing information and engaging in conversations that exchange information that give me insights into who you are as a person and what you do. Are you “real”? Would you treat me the same way offline that you do online – show the same interest in my well-being, in my life, in my business? It comes back again to – Are your actions, words, behaviors consistent on and off-line? So now that you have asked yourself these questions – Think about the answers? If you are not sure and even if you are, ask someone that you trust who knows you both off & online. Are you the same on & offline? Would I recognize you offline? 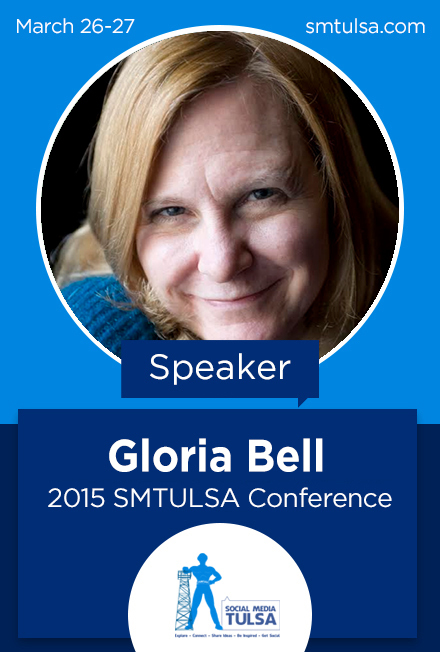 Gloria Bell invites you to participate in an exciting upcoming event called Spark! on June 1st from 5-9 p.m. at The Hub at Cira Centre. · Idea sharing events (Bloblive) providing the forum for entrepreneurs to voice their business idea and get live feedback from other attendees. Visit the Spark! web site for more information and to Register.